2 IS IT GOOD TO EAT SUNFLOWER SEEDS? 2.1 What are sunflower seeds? 3.5 How to eat sunflowers seeds? 3.6 Are sunflower seeds fattening? IS IT GOOD TO EAT SUNFLOWER SEEDS? Sunflower seeds are the achenes fruits of sunflower plant (Helianthus annuus L.), They are grayish-green, and covered by an outer shell (pericarp) that appears black, white or striated, depending on the variety of plant. Sunflower seeds contain an important source of key nutrients in a healthy diet: vitamin E, vegetable protein, potassium, phosphorus, calcium, iron, magnesium, thiamin, riboflavin, niacin, with very low intake of saturated fatty acids. In recent years there has been a very interesting assessment of the content of sunflower seeds and their medicinal properties. The most remarkable feature about the nutritional composition of sunflower seeds is its contribution in essential fatty acids and lecithin, along with the natural antioxidant of these fats, vitamin E, and riboflavin, which stimulates the antioxidant activity of vitamin E, thus enhancing its effect. The nature of these oils gives the sunflower seeds and sunflower oil their anti-inflammatory effects. 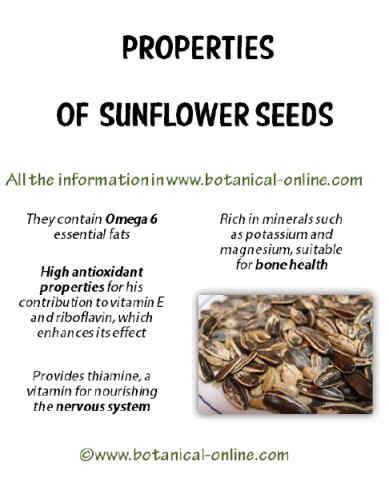 They also contain thiamin or vitamin B1, which has a role in the nutrition of the nervous system and converts sunflower seeds into the ideal complement for proper brain function, very good in times of stress, tests periods, in the diet for Parkinson, diet for multiple sclerosis, dementia and Alzheimer’s diet. Together with cysteine, these nutrients will give sunflower seeds beneficial properties for sight, being a very useful complement in diets for eye health. Sunflower seeds and, generally, oleaginous fruits, for its calcium content, should be part of dairy free diets. Therefore, sunflower seeds are suitable for diets high in calcium and vitamin requirements, such as pregnancy or lactation. They are also rich in potassium and magnesium, minerals, that, together with the good quality of these oils, make this fruit an ideal supplement in diets for hypertension and cardiovascular health. 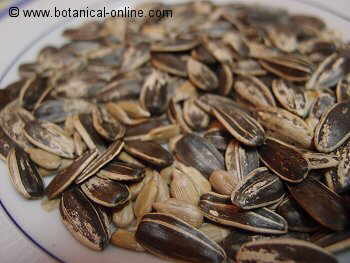 Sunflower seeds have a soft shell that allows to be easily broken. It is a remarkable feature that the consumption of sunflower seeds is often a hobby or a distraction, and for some a healthy “addiction”. Therefore, and for their nutrients, this delicious and fun snack is recommended in diets for quitting smoking. How to eat sunflowers seeds? – Roasted and salted. Wash and dry sunflower seeds. Place in a frying pan, add a pinch of salt, and toast in the pan on medium-low for 15 – 20 minutes, stirring constantly. Remove them, cool them well and place in a clean dry container. – Salads. Sprinkle some sunflower seeds on vegetable salads or on pieces of fruit salads. – Breads, pizzas: Incorporate them in the masses or preparations of breads, pizzas, rolls, etc.. Ideal for preparing seed and cereals breads. They can be added in the dough or sprinkled on the bread surface, providing an excellent nutritional value, besides visual appeal. – Bars. Sunflower seeds are an excellent ingredient to add to homemade cereal or energy bars, along with honey, dried fruit (raisins, apricots,…) and other oily fruits (hazelnuts, sesame,…). – Yoghurt: Adding some sunflower seeds to a yogurt makes it a different food, with important nutritional value, rich in calcium, magnesium and vitamins. – Glazed. Sunflower seeds can be glazed as almonds. One way to make it at home would proceed as with the toasted seeds, adding sugar instead of salt. If you want a sweeter taste, add butter for the sugar to adhere. – Sunflower seeds sprouts: Allow sunflower seeds to germinate seeds as with other grains, cut the sprouts after seven days of germination and eat them raw in salads. The sunflower seed sprouts are rich in vitamin A, thiamine, riboflavin, niacin, vitamin C, potassium, iron, magnesium and protein. This is a question people usually ask themselseve before eating sunflower seeds. The calorie content of sunflower seeds is very high (575 kcal per 100 g body weight), although this does not mean we should not eat this food for fear of gaining weight. The healing qualities of sunflower seeds justify its use but they should be eaten in moderation, especially if overweight or when we want to lose weight. So important the fat content of the sunflower seed is, that, from the beginning of the consumption of sunflower, Man has studied to improve its lipid value. Crop research has managed to extract species with different features with ideal properties according to the intended use: either for oil extraction, for fruit production or for animal fodder.